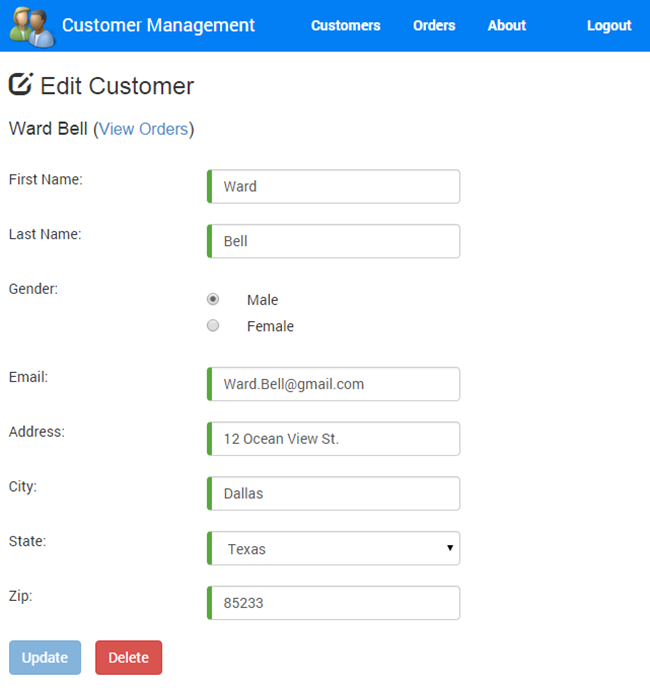 I’m always tinkering around with different ideas and toward the beginning of 2013 decided to build a sample application using AngularJS that I call Customer Manager. 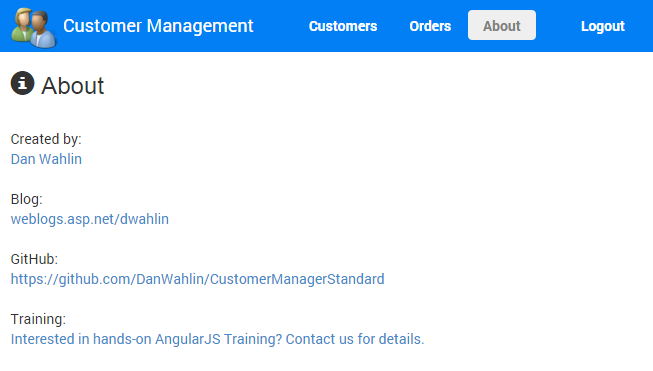 The goal of the application is to highlight a lot of the different features offered by AngularJS and demonstrate how they can be used together. I also wanted to make sure that the application was approachable by people new to Angular since I’ve never found overly complex applications great for learning new concepts. 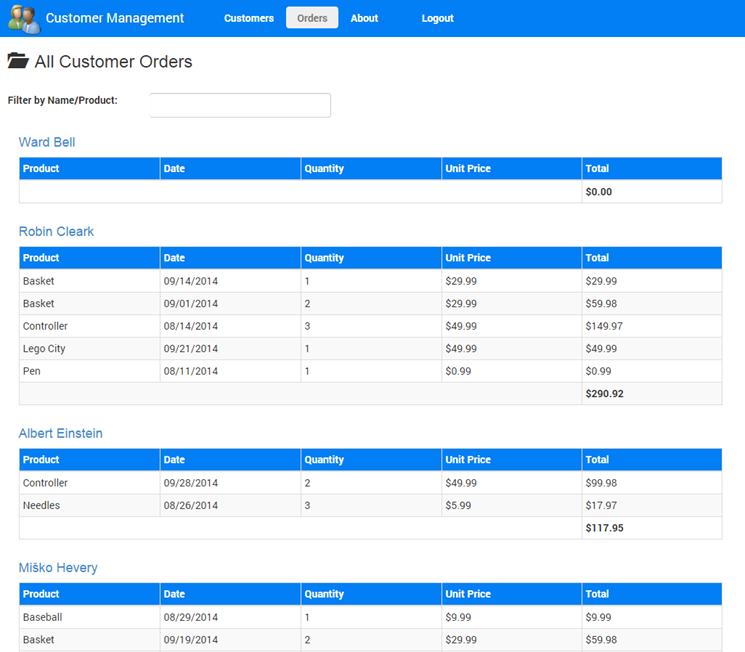 Using Breeze to retrieve and work with data (see app/customersApp/services/customersBreezeService.js). Switch the application to use the Breeze factory by opening app/customersApp/config.js and changing the useBreeze property to true. The structure of the application is shown to the right. The homepage is index.html and is located at the root of the application folder. It defines where application views will be loaded using the ng-view directive and includes script references to AngularJS, AngularJS routing and animation scripts, plus a few others located in the Scripts folder and to custom application scripts located in the app folder. The app folder contains all of the key scripts used in the application. There are several techniques that can be used for organizing script files but after experimenting with several of them I decided that I prefer content organized by module name (customersApp and wc.directives are examples of module folder names). 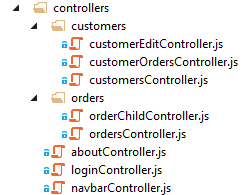 Within each module folder I follow a convention such as controllers, views, services, etc. Individual features are identified within a convention folder by using additional subfolders such as customers and orders. Doing that helps me find things a lot faster due to mixing the convention/feature approach. I’m a huge believer in having some conventions in place especially when it comes to team development. Having managed several development teams over the years I learned that consistency across projects is good since people come and go on teams and taking that approach allows files to be categorized and located easily (such as controllers and services). If you’re new to an app (a new hire, production support, a contractor, etc.) and are given a pure feature-based folder structure to work with it can be challenging to find things if you don’t know the app features well since whoever created the folder structure did it based on their way of thinking about the app. If some convention is mixed in with the features it becomes much easier to find things in my opinion and it makes it easier to understand multiple projects – not just one. On the other hand, going with a pure convention-based approach causes challenges with large applications since a controllers folder could have a ton of files in it which is why I like to segregate things by module/convention/feature. Animation code for some custom animations is located in the app/customersApp/animations folder. In addition to AngularJS animations (which are defined using CSS in Content/animations.css), it also animates the initial customer data load using a 3rd party script called GreenSock. The directives folder contains the custom directives created for the application. Directives that can be used across projects are placed in the wc.directives/directives folder which represents the module/convention approach. The filters folder (app/customersApp/filters) contains the custom filters created for the application that filter city/state and product information. The partials folder contains partial views. This includes things like modal dialogs used in the application. The services folder contains AngularJS factories and services used for various purposes in the application. Most of the scripts in this folder provide data/Ajax functionality. Two types of services exist to send and retrieve data to/from a RESTful service. The application uses $http by default but can be switched to use BreezeJS (an alternative way to work with data) by updating the config.js file. 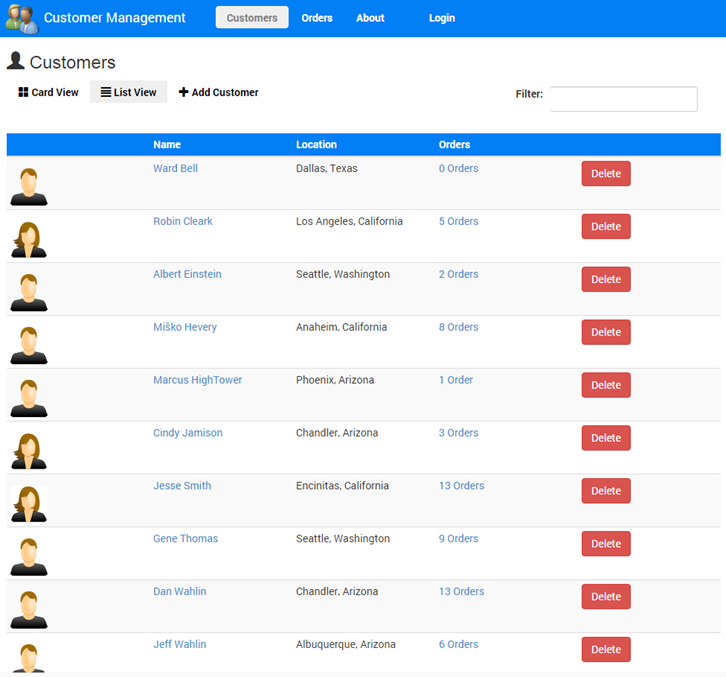 The Customer Manager application (grab it from Github) provides two different options on the back-end including ASP.NET Web API and Node.js so you'll want to select one of them in order to run the application. The ASP.NET Web API back-end uses C# and Entity Framework for data access and stores data in SQL Server (LocalDb). The other option on the back-end is Node.js, Express, and MongoDB. To run the application using ASP.NET Web API/SQL Server back-end open the .sln file at the root of the project in Visual Studio 2012 or higher (the free Visual Studio 2013 Community Edition version is fine). Press F5 and a browser will automatically launch and display the application. 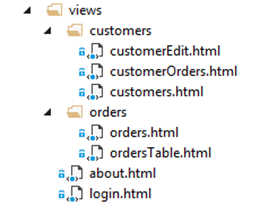 Under the covers, Entity Framework code first is used to create the database dynamically. To run the application using the Node.js/MongoDB back-end follow the steps listed in the readme on the Github site. The application uses native AngularJS $http by default to make calls back to the server. However, by going to app/customersApp/services/config.js you can switch from using $http to using BreezeJS (a very cool client-side data management library). When using BreezeJS you’ll also want to include Breeze Angular Service (the script is already loaded in index.html to keep things simple). For more details on what BreezeJS is all about check out my previous post. This view provides multiple views of customer data (Card View and List View), supports paging, allows customers to be added or removed, and provides filtering functionality. 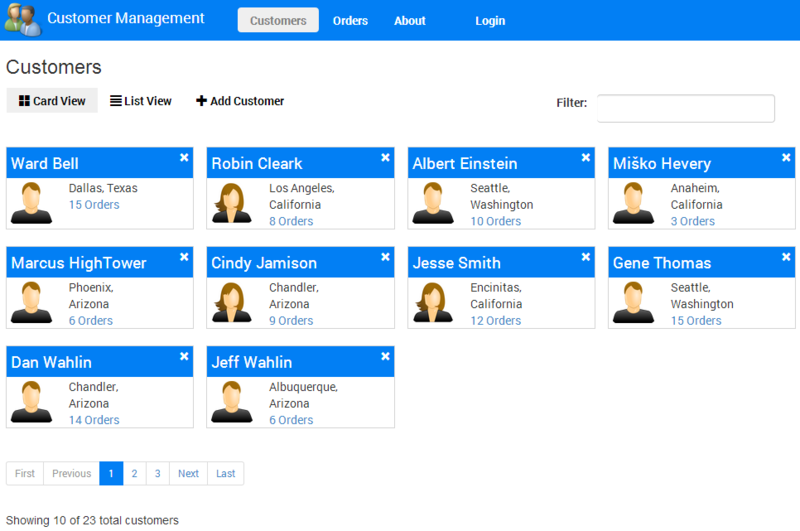 This view displays customer information and allows customers to be edited (by clicking their name), deleted (by clicking the X), or their orders to be viewed. 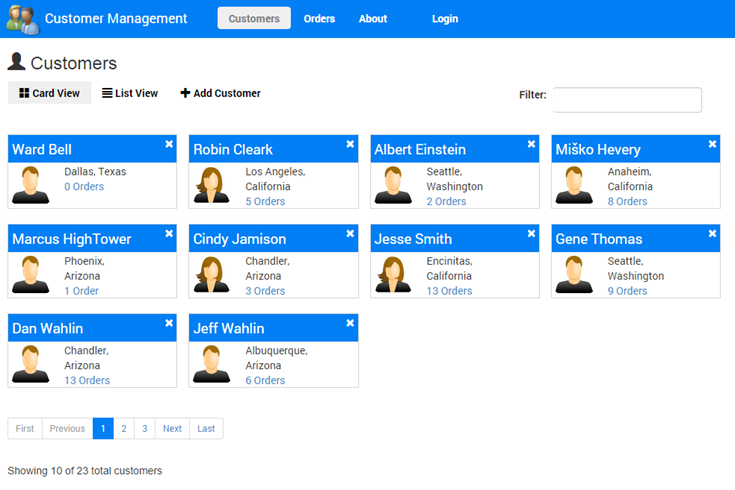 This view displays customer information in a standard list type of view. This view allows the user to login. Security isn’t officially checked on the server for this demo as it just returns a boolean true value but the client-side does have security functionality built-in to show how that could be integrated with AngularJS, how events can be broadcast and handled, and more. Keep in mind that in a “real” application every secured resource on the server would have to be checked for the proper security credentials regardless of what data or information the client has. This view adds some custom AngularJS validation including a custom directive (wcUnique.js) that ensures that the email address being added is unique. This view shows the orders for a specific customer. Orders can be sorted by clicking on the column headings. 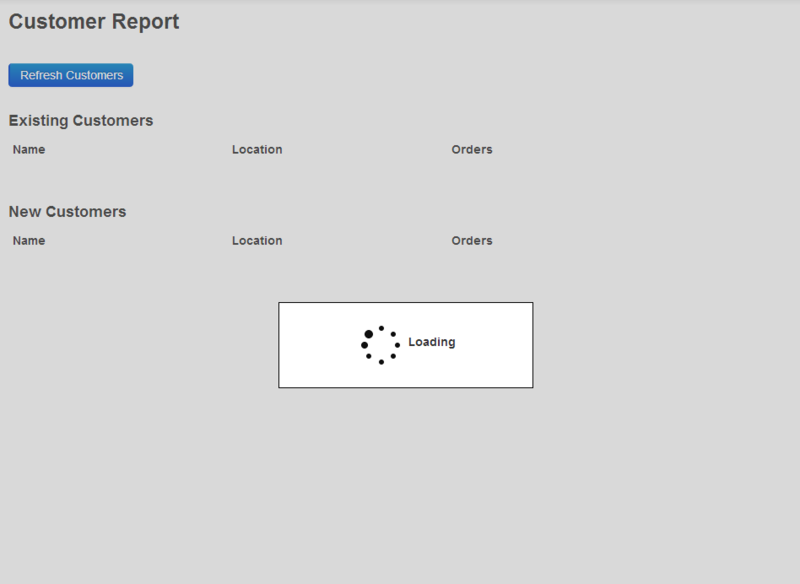 This view shows orders for all customers and supports paging, filtering, and sorting of the orders. There isn’t much to this view but I listed it for the sake of completeness. Unique value directive (app/customersApp/directives/wcUnique.js) – This directive ensures that email addresses entered on the customer edit view are unique. It makes a call back to a service and then calls ngModel.$setValidity() to handle showing or hiding an error message. A post on this directive can be read here. Angular Overlay directive (app/wc.directives/directives/wcOverlay.js) – This directive intercepts XmlHttpRequest calls and displays a custom overlay (tracks AngularJS calls as well as jQuery). The directive is available in the application or as a stand-alone directive on Github. Menu highlighter directive (app/wc.directives/menuHighlighter.js). This directive is responsible for highlighting menu items as a user clicks on them. I’ll be enhancing the application even more over time and welcome contributions as well. Tony Quinn contributed the initial Node.js/MongoDB code (thanks Tony!) which is very cool to have as a back-end option and several other contributions have been made for testing and the initial version of the menuHighlighter directive. Access the standard application here and a version that has custom routing in it here. Additional information about the custom routing can be found in this post. I loaded this into a Tomcat env and the code has many case issues when it comes to pathing and finding resources. 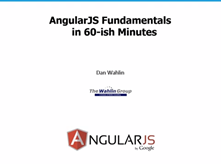 By far the best AngularJs learning resource out there !! Dan, I have a question: I've tried to combine: AngularJs + RequireJs + AngularFire + Firebase, however I'm having problems, AngularFire generates an error saying that angular is not available. Have you tried and succeed on this? Thanks Dan. Very useful. Learning tons here. It is the one I have been googling for since last month. What a great article about angula,node and mongodb!!! I haven't played with Firebase at this point (only looked at a few demos) so I'm not sure what might be causing that error. I'd recommend posting details about what you're seeing to Stackoverlow.com to see if anyone else has experienced that error. Out of the box the app is designed to run with either Web API or Node.js as mentioned above. If you're trying it in a different environment you may have to change paths and things - hard to say since it hasn't been tested/run in a Tomcat environment. It should be pretty straightforward to do though since all of the script references and resources are in index.html. I went through the eBook and got to the $RouteProvider section and then began getting errors. I researched the error and saw that the current version of AngularJS did not include route information and I need to add that script reference as well. I did this, but still I get a Module Injection error. That's correct - they changed that with version 1.2. You'll see that in the sample app above. Make sure your module definition includes ngRoute. Sounds like you already included the angular routing script in your main page. how to solove IE compatibility issues ? Otherwise express throws an error and will not start the app. Now the question: You have defined two services the modalService and the dialogService. Of the two, it seems like only the modalService is being used in the application, correct? Why have you included the dialogService then? I am confused. kindly explain. I have an error when I load AngularJSDemos with Visual Studio. Ps help on this case.